In the introduction to last week’s article, we made brief reference to the Court of Appeal’s decision to overturn the ruling of the former acting Chief Justice on the “2012 budget cuts” case. In the last week or so, the report of the Commission of Inquiry into the death of world-renowned historian and scholar, Dr. There were two recent news items that are worthy of commentary from this Column since they have implications for the state of public procurement. Last week’s article dealt briefly with the requirements for the appointment of auditors of companies. The general debate on the 2016 budget is now over. It was to be confined to the financial and economic state of the country and the general principles of Government policy and administration, as outlined in the Finance Minister’s budget speech and in the Estimates. A former Minister accused me of being unprofessional in discussing in one of my columns the report on the forensic audit of the National Industrial and Commercial Investments Ltd (NICIL). The Stabroek News recently carried an article which centred around a legal opinion that was given on the applicability of Article 216 of the Constitution to the National Industrial and Commercial Investments Ltd.
Last week’s article completed our “stock-take” on where we stood in terms of public financial management. On 28 December 2015, we carried an article on the above subject but we were unable to complete it because of space constraints. Last Thursday, the National Assembly considered and approved two financial papers that were presented by Finance Minister Winston Jordan. The year 2015 is about to come to a close. It is a time when business organisations are conducting physical stocktaking exercises to identify and value their inventories, other assets and liabilities for the purpose of closing their books and preparing their financial statements. Before proceeding with today’s article, I refer to the comment by parliamentarian Juan Edghill in connection with the forensic audits being conducted at various government agencies and departments. In 2014, Cabinet appointed the Chief Executive Officer of the Guyana National Industrial Company Inc. The International Anti-Corruption Day will be observed on Wednesday, 9 December. According to the United Nations Office for Drugs and Crime (UNODC), to mark this occasion Governments, the private sector, non-governmental organisations, the media and citizens around the world will be joining forces to fight this cross-cutting crime which undermines social and economic development in all societies. On Wednesday, the Government signed a Memoran-dum of Understanding (MOU) with Fedders Lloyd Corporation for the resumption of the design, construction and outfitting of the Specialty Hospital at Turkeyen, East Coast Demerara. So the Amaila Falls Hydro Project is back on the front burner. The Government of Norway is expected to fund another study to determine once and for all the project’s feasibility, while the Government of Guyana has indicated that this is one of the several options being considered as possible sources of renewable energy. Before beginning today’s article, two issues raised recently in the print media are worthy of comment: the extension of Baishanlin’s State Forest Exploratory Permit (SFEP); and the Presidential Inauguration expenditure. There must be no compromise on integrity, no allowance for arrogance, no room for violation of mutual respect; there will be no sacrifice of our values on the altar of political expediency…No one is exempt from the measure of value based leadership…All my considerations are character driven. Last week, we began a discussion of the Auditor General’s 2014 report which was laid in the National Assembly two Thursdays ago. It was recently drawn to my attention that I had made a mistake in a number of my articles when making reference to the Public Corporation Act of 1988 and that there was an amendment to the Act which I did not take into account. Corruption is an insidious plague that has a wide range of corrosive effects on society. Before proceeding with today’s column, the recently announced 50% increase in the salaries of Ministers has created, quite justifiably, a tsunami of criticisms and condemnation from all sections of the Guyanese society. Before proceeding with today’s article, a few days ago, it was reported that Transparency International released its Corruption Perceptions Index (CPI) for 2014. Last week’s article on the role of the Permanent Secretary and Regional Executive Officers (REOs) in our system of public financial management generated some positive reactions. With the change in administration following the May 11, 2015 national and regional elections, several Perma-nent Secretaries and Regional Executive Officers (REOs) have either been replaced or have resigned because they were candidates for the opposition political party. Last week, the Institute of Internal Auditors Local Chapter held a two-day workshop/seminar under the theme, “Transparent Governance (Accountability for Public Funds; Internal Audit Impact in Financial Integrity). As the announcement came that the Government has agreed to introduce a river taxi service across the Berbice River, I could not help but reminisce about the time when the Transport and Harbours Department was operating a ferry service from Rosignol to New Amsterdam. (Part II) Last Monday, the National Assembly resolved itself into the Committee of Supply to consider the Estimates of Revenue and Expenditure for 2015. 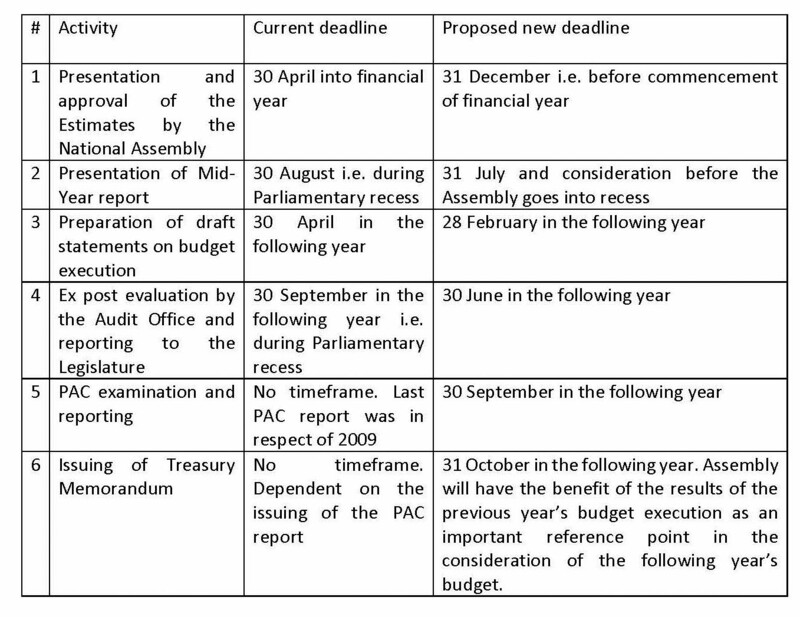 Following the Minister of Finance’s presentation of the 2015 Budget on 10 August 2015, the National Assembly began a week-long general debate on the budget speech, as provided for by Section 71 of the Standing Orders of the National Assembly. Last Monday, the Minister of Finance presented the 2015 Budget to the National Assembly in keeping with the requirements of Article 219 (3) of the Constitution. Last week, we discussed the Government’s decision to pay over all proceeds from the Lotto funds to the Consolidated Fund. According to news reports, the Minister of Governance, Raphael Trotman, announced that the proceeds of the “Lotto Fund” will be paid directly into the Consolidated Fund and that the Minister of Finance would issue the relevant order soon. Last week article’s generated quite a discussion in the media and elsewhere. We did indicate that several key items in the plan will have to await the approval by the National Assembly of the 2015 Budget. Today marks the 70th day since Guyana held its 2015 national and regional elections. Today’s article focuses on three events that made the news during last week. Last Friday, there was a launching of my book entitled “Public Accountability at the Crossroads: the Guyana Experience” under the auspices of the Transparency Institute Guyana Inc.
Last Friday, the National Assembly approved of the Anti-Money Laundering and Countering the Financing of Terrorism (Amendment) Bill 2015 which had been the subject of bitter disagreement since 2012 between the previous Administration and the then political Opposition. The new Administration has announced that it is reviewing the performance and efficiency of publicly owned entities, statutory bodies, projects and activities financed by or through public funds. Last Wednesday saw the opening of the eleventh Parliament of Guyana with the much-welcome fanfare, pomp and ceremony, following the 11 May 2015 national and regional elections. Reports emanating from the Office of the Presidency indicated that several persons have had their contracts terminated for blogging and fictitious letter-writing in the print media on behalf of the then ruling party. Last week, we carried our first article since the new Administration took up office following the 11 May 2015 national and regional elections. Monday, 11 May 2015, was a historic day for Guyana, as citizens across the length and breadth of Guyana came out in their numbers to cast their votes for the political parties of their choice. This column joins the several individuals and organisations, including the diplomatic community, in congratulating the APNU-AFC coalition on winning the 2015 general and regional elections. Today is Election Day. It is the sincere hope of this column that peace will prevail in an atmosphere free of fear or intimidation, as citizens proceed to cast their votes for the political parties of their choice. This is the fourth part of a series of articles on public financial management in Guyana’s post-Independence period. This is the third article in a four-part series on the above subject. About a week ago, the ruling party placed an advertisement in the Kaieteur News highlighting an article in the Guyana Chronicle dating back to November 1992. Last week, we began a discussion of Guyana’s public financial management systems in both the pre-1992 and post-1992 periods. 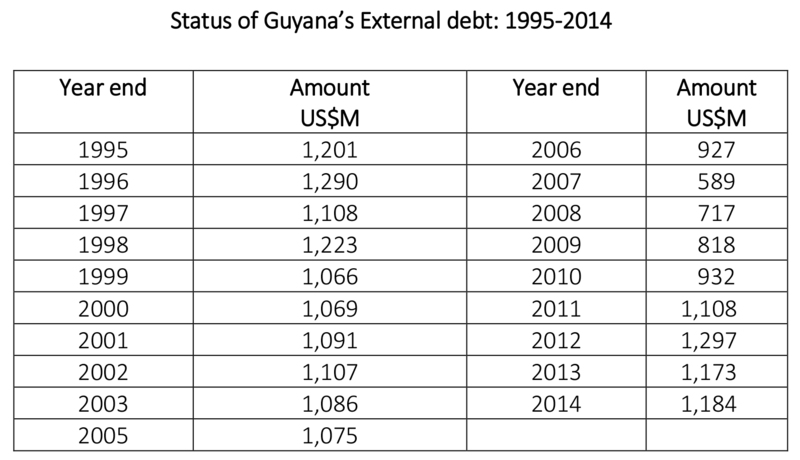 Guyana has had a sad history of public accountability since it attained its Independence.